Half-way through this series, and we’ve heard three very different stories of arriving at home education – Lizzie, who wanted to be able to try out different ideas for learning and play; Jenny, who didn’t want to miss out on time with her children; and Louisa, who knew her son needed her undivided attention if he were to grow into a healthy, well-adjusted adult. Today we meet Suzy, who didn’t choose home education at all, but whose circumstances left it as the only option. I’m Suzy, married to Chris, with three kids aged five (girl), three and one (boys). We are from the UK but currently live in the very west of Ethiopia, close to the border with South Sudan, in a town called Gambella. My husband is Academic Dean of a theological college here and I am a stay at home mum. Prior to motherhood, I was a secondary school RE teacher. I would describe myself as a reluctant home educator because, given the circumstances, it’s really the only sensible course of action for the time-being. However, as I began to think about embarking on home education with my eldest, I read a little about Charlotte Mason (an early 20th-century educationalist) which I found quite exciting and motivating. We are in the very early stages of home education. My plan is to eventually do about 90 minutes a day, four to five days a week. In reality we normally do about 45 minutes, two to three times a week. Normally, my youngest goes down for a nap, and either me or my eldest suggests we do some home school. So formal home educating makes up a very minor part of our day! Perhaps I am better described as an unschooler. Knowing that I’m really the only source from which my kids are going to learn some fairly important ideas means I’m aware of needing to make the most of every opportunity. I try and find opportunities for learning where I’m not sure I would otherwise. For example, we have an upcoming trip to Egypt, so we have been talking about the country, looking at maps, reading about pyramids, and so on. If we’re out and about we often pick up things and bring them home to talk about what we found. My husband works full-time outside the home, but he plays an active part in our children’s education as much as he can. He regularly reads with our eldest, and they like to play chess and other board games together. He will involve her when he’s using some children’s software to learn Ancient Hebrew (for his teaching here), which she really enjoys. We’re trying to be more deliberate about combining home education with family time. For example, once a week we all try and sit down, eat pizza and watch David Attenborough documentaries together. I appreciate all the time I am able to spend with the children while they are young. Largely, it is fun! I’ve also found that our three-year-old is benefiting from listening while I go through some things with our eldest. He sometimes sits with us and other times just plays on the floor. The other day I heard him reciting the months of the year in his room. I have never taught him this, but I was doing it with his big sister! He is clearly picking up on more than I realise. With less time on my hands, I think it is very unlikely I would bother with things like making greeting cards or baking with our kids. Because we have a lot of time together, we do these things, and we benefit from doing so. Our kids are all becoming pretty creative, and I’m sure in part it is because they have a lot of time and space to just play. I enjoy not being dictated by a curriculum that I need to fulfil. We can take time to enjoy things that they particularly enjoy, and I know we can catch up on other things at a later point. If there’s something our eldest is struggling to figure out, I’m learning to put it aside for a bit and look at it again a few months down the line. It’s lovely to have the freedom to do this. 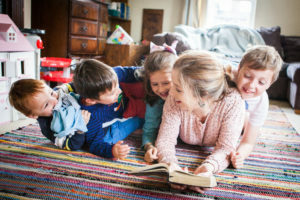 Home education has helped make us a tight family unit, and the kids are able to play really well together – in part due to lack of other options! But I imagine they will be close growing up. A lot of home education resources assume unlimited internet access, which is not a luxury we enjoy here. And to do the kind of home educating that I would really like to requires a lot of research and planning. It turns out in reality, I’m too selfish to want to spend my evenings and weekends doing this level of preparation! Sometimes I find being both parent and teacher a difficult path to walk. When our daughter doesn’t understand something, or isn’t really concentrating, I can easily revert into parent mode and become frustrated or cross, which isn’t very helpful. Managing my children’s different ages and stages is another challenge. I can only really teach our daughter when our youngest son is sleeping, and some things are not possible e.g. learning the recorder, because there are too many arguments about who gets to play it! However, this will change as the boys get older. I don’t often get time to myself, but I think that’s mainly to do with the fairly unique context we are in rather than the home educating. We put the kids to bed as early as possible and have long evenings. Social time for our kids is thin on the ground, but again that’s mainly to do with where we live. However, another family have now moved on site with two children. The kids spend all afternoon running around together outside. This family also home educates, and in the future we hope it might be possible to combine some of these lessons and do them together. A continuing challenge is ensuring that our kids get a broad perspective of different ideas and opinions. I think it is important to share our thoughts about life and faith, so long as I present the fact others might think differently, and provide the necessary tools for my children to decide what they think. I signed up to Twinkl, a great website which costs around £20 per year. Written by teachers, it provides schemes of work, lesson plans, powerpoints, and worksheets – everything can be downloaded. However, I often find it difficult to print here, not to mention putting in the time required in the evenings to be organised about our lessons and ensure we’re covering everything required. For these reasons, I am about to start a proper home education programme, and this will cost a lot more. Thankfully the organisation we work for will pay for this programme! At this point I am certain our children will enter mainstream secondary schools – and this will require us to move back to the UK in time for our eldest to do so. However, if for some reason any of them were to have a particularly difficult time reintegrating into mainstream school/UK life, assuming my situation allowed it, I would seriously consider home education as an option. 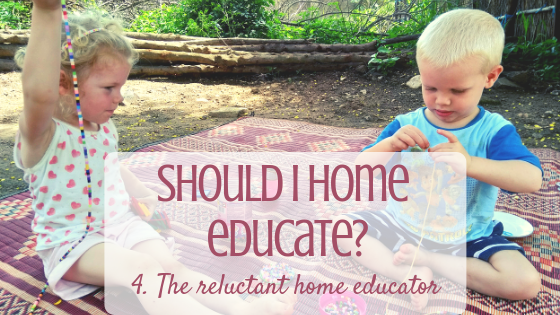 I know I wouldn’t home educate unless I was in a situation that requires it, but in many ways I am so glad I have to, because already I can see there are big benefits to doing so. My advice to others starting out is find a way of doing it that suits you. Trying to plan and organise it myself to save money has not worked, so I am going to try a programme that does all the hard work for me. I think this will be so much better for us, and I’m looking forward to starting. Read Suzy’s blog about life in Gambella here. Do you have questions or encouragements for Suzy? Leave them in the comments! Read story no.5 “The individualised home educator” here.